- Let your customers know about what's happening in your business through local media. - If you have an interesting event happening at your cafe, let local media outlets know. 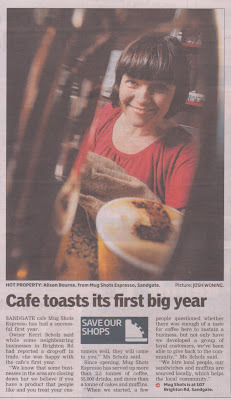 Our espresso bar Mug Shots was in the local paper today, celebrating our first year up and running. The article was an update on an ongoing series in the Northside Chronicle about trading conditions in our local suburb. Some local businesses have noticed that since a large supermarket moved out of its previous location into a new shopping centre, foot traffic has gone down. While we haven't been open as long (and so haven't been able to compare), we were definitely told by many that our suburb just didn't have the local interest in coffee to remain viable. And that was before we'd opened our doors. From the start, we've believed that we can serve a consistently excellent coffee; from the beans we source, to roasting our own, to serving up every cup. That's 55,000 this year. Our aim every day is to give our customers excellent customer service, and we back it with a money-back guarantee. We may not get it right every time, but we encourage feedback, and appreciate it when we receive it. At the end of the day, our customers have repaid us with their ongoing support, which allows us to work with the local community, to provide employment in our business, and our suppliers' businesses. For that, we thank them. Why is coffee in Paris so bad?